Increased frequencies of flooding are placing our growing global population at risk of property loss, displacement, and death. There is an urgent need to address these issues using innovative building methods and technologies. In Vietnam’s Mekong Delta, due to growing urbanization and climate change, the region is experiencing increasingly unpredictable and destructive flooding. One such strategy is the practice of amphibious construction, which allows an otherwise ordinary structure to float on flood water rather than suffer damage from inundation. 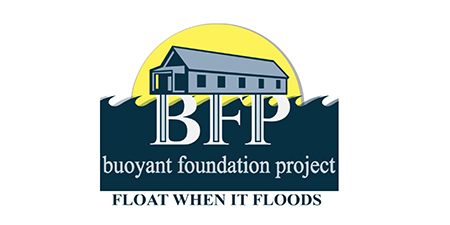 A buoyant foundation is a flood-mitigation technology specifically designed to retrofit an existing structure, allowing it to rise with water during a flood and return safely back to the ground when floods subside. This strategy works with, instead of resisting, changing water levels and is an entirely passive system that keeps a home safe from the destructive forces of floodwater. It ensures that possessions stay safe and residents don’t suffer prolonged displacement. A buoyant foundation retrofit is ideal for any house that is already slightly elevated and supported on short piers in areas that do not face high-velocity flooding. The design of a buoyant foundation uses three simple elements that can be easily built using readily available materials: buoyancy blocks to provide flotation, vertical guidance posts to guide the movement of the house and a structural frame to tie these to the house’s existing structure. While amphibious construction is a new approach to housing in Vietnam, it is welcomed by residents as a viable solution to destructive flooding, one that combines local architectural typologies on land and water. The long-term objective of the project is for the use of buoyant foundations as a viable method of flood mitigation and climate change adaptation. The project benefits economically vulnerable communities: it is a low-cost strategy that uses local and simple construction techniques, making it socially and economically feasible and adaptive to local methods of building. Using our current funding through the Global Resilience Partnership as a starting point for advancing the practice of amphibious retrofits and buoyant foundations, we hope to continue to secure funding that will expand this strategy and encourage its use by entrepreneurs, builders, engineers and local governments. This practice is extremely beneficial for locations like rural, agricultural Vietnam where residents are already adaptive and self-sufficient to annual flooding, but are not able to protect themselves from increasingly intense and frequent flooding. Over time, the one-time cost of a strategy like this will have immense financial benefits in the face of extreme annual flooding. By involving and educating interested members of the community such as entrepreneurs, homeowners and builders, communities such as the Lang Sen Wetlands can increase their ability to live safely and passively with flooding. Buoyant foundations work passively with changing water levels instead of resisting them, elevating houses to the level required to stay above water. Unlike houses elevated to a fixed level, houses retrofitted with buoyant foundations can easily accommodate varying levels of water and provide protection even during extreme floods. This strategy increases a house’s structural integrity by making it less susceptible to hurricane and wind damage, and accommodating long-term problems of soil subsidence and a rising sea level. Compared to static elevation, this strategy is less disruptive to the everyday lives of residents by allowing the house to maintain its original appearance, and increasing accessibility by keeping the house close to the ground and removing the need for staircases. Each of our projects use three core methods to ensure large positive impacts, feasible implementation and replicability. Firstly, the planning of the project focuses on the long term desired goals for the community, every phase of our work forwards to increase the preparedness and recovery of communities facing flooding. Secondly, through the combined power of up-to-date research and innovative design, we can propose unique solutions to the local effects of flooding in different regions. Finally, our process of implementation involves interested community members, equipping them with the knowledge and ability to continue this strategy in the future. By encouraging replication through education, we hope to increase the well-being of communities in the face of flooding, an event they cannot prevent but can learn to adapt to. To create sustainability and self-sufficiency, methods like amphibious architecture need to be widely implemented, creating a world in which we learn to adapt to a changing environment. This long-term goal can be achieved through growing projects like our initiative in Vietnam’s Mekong Delta, where its overwhelming benefits can be understood and learned from for future replication. While amphibious construction is not yet widely implemented, it is not a new concept; used in Old River Landing, Louisiana for over forty years, it is a practice that has seen to be more widely implemented as its benefits become clear. By increasing awareness through more design and implementation, the process can become widely implemented to benefit communities in flood mitigation and climate change adaptation. Replicability is one of the key benefits of this practice as with each retrofit a framework is created for the community to carry on producing buoyant foundations in the future. As part of an ongoing project partially sponsored by the Global Resilience Partnership, the project is spearheading an 18-month collaboration with institutions and government agencies in Vietnam to retrofit houses in the Lang Sen Wetlands, at a crucial point along the Vietnam-Cambodia border, the wetlands are a protected biodiversity zone. Houses sit on the landscape beside and between parallel lines of water and elevated road, and for many, being safe from floods means being raised on stilts to a level at or above the surface of the road. However, not all residents can afford the cost of static elevation to this height and as such are subject to frequent annual inundation. Dang Van Nang, a resident in the wetlands, faces this very problem. His house is the first of a series that we aim to retrofit with buoyant foundations to provide them with safe and dry dwellings resilient to destructive flooding. Once Nang’s house is complete, its performance will be monitored during a season of flooding to improve the designs of the next five retrofits in the first phase. Based on the outcomes of these prototypes, training manuals will be compiled that include basic guidance on amphibious construction and a basic cost estimation tool. These manuals will be circulated through our Vietnamese partners to continue to build the community’s capacity by means of knowledge transfer.